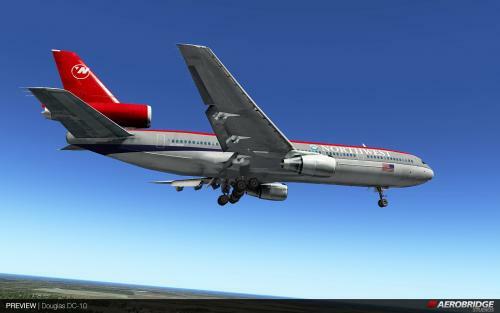 The DC-10 is uploaded here upon popular request, and that the dropbox link is suspended for having too many downloads. 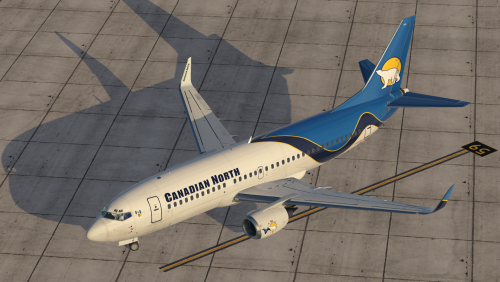 Canadian North 737-300s, originally by Veace, updated by me. C-GZCN is the combi variant. For realism, you wouldn't use the winglets on this, as they don't have them. I've updated and fixed some little inaccuracies, such as the flags, the logo placement (for these particular airframes, where Veace had it for his registration was accurate), added fin numbers to the tail and nose gear doors, painted the winglets, added the barber pole colours to the antennae, and a couple more little things. I didn't touch the swoopy pattern by Veace, as my talent for that kind of thing pales in comparison to his. There are some inaccuracies, such as the doors all being the same colour, and no registration under the wing, since I'm limited by the IXEG model. I've also included an accurate Canadian North Yoke Checklist, which is the B733_nolit.png file. That one has to go in your IXEG 733 Classic/objects folder, and it will overwrite any other file in there, as well as give that checklist to every 733 in your fleet. So use at your discretion. If there's anything else that you think could be added, PM me on the org! 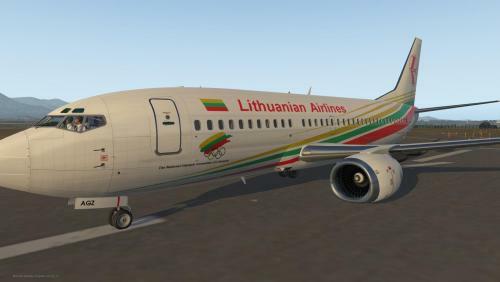 Lithuanian Airlines livery for the IXEG 737 Classic based on the 737-500 (LY-AGZ) from 2004 featuring the Olympic logo. This is the Boeing 767-200ER with Pratt and Whitney PW 4000 engines and a large cargo door at the front. The plane comes with many nice features and two liveries, Air Canada "frosted leaf" and Air Canada "silver bullet". Inside the package, there is a manual, THIS MANUAL IS VERY IMPORTANT AND YOU SHOULD READ IT FOR FLYING. If you own the 767-200 non ER, all the data is the same except for the highest efficiency flight rules. The plane also comes with a 2d panel that SHOULD be pretty easy to follow. The manual also details how the plane should be flown. Liveries for this aircraft should be shown to me first, and the file must specify which model of aircraft it is for (A, B, AL, BL, AWL, BWL) if you are unsure, please feel free to ask. NO MODIFICATION OR DISTRIBUTION OF THE AIRCRAFT IS ALLOWED UNLESS ALL OF THE ABOVE PEOPLE GIVE WRITTEN CONSENT OF SUCH ACTIONS. ALSO, PLEASE BE SURE TO TURN OF THE YAW DAMPER IN FLIGHT OR ELSE YOUR PLANE WILL HAVE AN EPILEPTIC SEIZURE. Now that all the 200 and 300 passenger variants are through, here's something new! Just a note, the BCF is one of two cargo variants of the 767-300. The other is the 767-300F. The BCF is different in the fact that it has a regular sized rear cargo door. The 767-300F has a larger rear cargo door, which i will show you when it is released. It is VERY heavy, it has a significantly higher Payload capacity, and therefore has a tendancy to seem very overweight. Reading the manual is very useful, be sure to take a look at it before consulting with me. Redistribution of this file without the consent of all of the above is strictly forbidden and will not be tolerated. Enjoy your flights, Michael Chang. This plane has a set of stairs that appear when the main PAX door is opened, activation is covered in the manual. The 767s are finally coming to an easy-to-access website known as x-pilot.com! This model is the Boeing 767-200ER with GE JT9D engines and a large cargo door in the front. No liveries are included for this model. Inside, you'll find an Excel spreadsheet that will detail all the airlines that have ordered this plane and the engine type that they used. ALL LIVERIES MUST SPECIFY WHICH VERSION OF THE AIRCRAFT THEY ARE FOR. IF UNSURE, PLEASE CONSULT WITH ME. AND PLEASE TRY TO CREATE LIT MAPS FOR THE PAINT AS WELL, AS MAKING THEM ON MY OWN IS TIME CONSUMING. detailed animations including dynamic wingflex, gears, flaps, flight surfaces, speedbrakes, doors and a ground servicing units. accurate flight systems tested by a boeing 767 pilot. All files within this package are copyrighted to me, the FSXP team and all members listed below. Redistribution is strictly forbidden unless all members below are asked for their respective parts. This is the Boeing 767-300BCF. Based on the default/Zibo 737-800.Enjoy! This is the Boeing 777-8X, a next generation composite airliner expected to be introduced in late 2019. 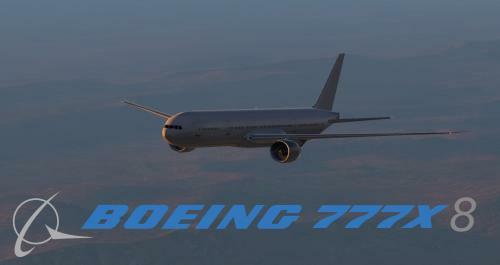 This is a modified version of the B777-200 included with the X-Plane 10 default aircraft library, by Mohammad Gazzawi and Sergio Santagada. This release of this plane marks the final release in the Boeing 767 family, 35 fully animated and beautifully crafted models. Kinda amazing how there are so many versions of the plane. I'm so thankful that you all decided to welcome me back and give me this chance to prove my abilities. This was a great run of planes and i can't wait to see this all again when the 787 rolls onto the production line. A special Wingflex formula, the same used on my future 787! Boeing 767 "leading the way"
This is the McDonnell-Douglas MD-94X, a proposed MD-90 variant with the PW/Allison 578-DX Propfan engines. This aircraft was modified from Skycycle's 717, with permission, and contains the 717 Cockpit panel and modified livery. Nova pintura da Gol para o Boeing 737-800 da EADT. New Gol paint for EADT Boeing 737-800. Basically the default x-plane 10 747, but with many corrections to its animation and an overhauled flight model. 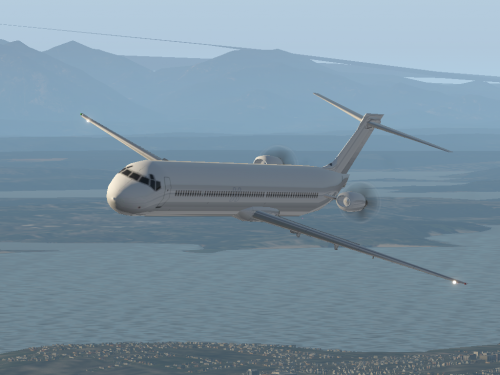 I could not stand the inaccuracies of the default XP10 747, and I have waited for quite a while for someone at Laminar to fix them. A lot of data in PlaneMaker is totally off, including the outrageously high SFC (at 0.600) which made my plane crash at the tip of Hokkaido while I flew from LAX to TPE. The animation of the slats were disgusting too. And the last wire was the fact that roll spoilers aren’t animated. So one day I woke up and decided to fix them myself. This file was uploaded onto the org a week ago, but here it is. The objects here are much more refined than the ones I uploaded on the org, with edited landing gears, wings, and horizontal stabilizers. ​Includes four aircraft, one for each type of engine! Accurate SFC for PW4056, PW4062, GE CF6-80C2B1F, and GE CF6-80C2B5F. Information from http://www.jet-engin.../civtfspec.html , a complete chart of every engine out there. The PW4056 has 56,750 lbs of thrust, with sea level SFC at 0.320 and high altitude SFC at 0.572. This is the one that is used on the default United livery. The CF6-80C2B1F has 57,160 lbs of thrust with sea level SFC at 0.316 and high altitude SFC at 0.564. Used on China Airlines, JAL, KLM, Lufthansa, Eva Air, and a bunch of others. Bypass ratio 4.9 for PW engines and 5.2 for GE engines. [*]I learned AC3D and tilted all landing gears at the right angles. [*]Horizontal Tail moves with trim. [*]Landing gear deployment time edited. [*]Resized outboard ailerons in flight model from 20% into 30% of chord to match real size. [*]Outboard aileron deflection now 15 degrees down and 20 degrees up. [*]Outboard aileron locks past 270 KIAS, just like the real thing. Now while flying at high speed roll rate is slow because you only have the inboards. This is implemented in the flight model and the wing object. [*]Accurate engine data, different for each engine, including bypass ratio, max RPM, thrust, critical altitude, and a bunch of other tweaks. [*]The outmost two (1 and 2) only act as roll spoilers in flight at 45 degrees, but acts as speedbrake at 45 degrees on ground. [*]Spoilers 3 and 4 act both as flight and ground speedbrakes and roll spoilers at 45 degrees. [*]Spoiler 5 act as roll spoiler and flight speedbrakes at only 20 degrees, but ground speedbrakes at 45 degrees. [*]Spoiler 6 does not act as roll spoiler, but only speedbrakes at 20 degrees. [*]Now the roll spoilers move visually in wing obj. Before the objects only moved with speedbrakes, not spoilers. [*]The kruger-flaps looked retarded on the default 747 because they only opened up half way. They look less retarded now because I edited the animation and they open up fully. The kruger-flaps were not modeled correctly, so they still look some-what stupid. [*]In the real 747, the inboard kruger flaps open at flaps 1 while the outboard at flaps 5. This is now modeled in the flight model and the object animation by editing the obj file with a text document. This took an agonizing three hours. [*]The horizontal tail and vertical tail had too thick airfoils. I changed the vertical stabilizer to NACA 0006 and the horizontal stabilizers to NACA 64-209 inverted at the root and NACA 64-206 inverted at the tip. And I have different airfoils for the h. stab at low and high Reynolds! [*]The winglets had thick symmetrical airfoils, but in the real thing they produce lift so they are not just wing fences, so I used NACA 64-206 airfoil. [*]Vertical tail sweep slightly refined. [*]Autopilot rings when approaching target altitude. [*]Stall warning alpha raised from 10 to 15. [*]Maximum control deflection time is 0.5 seconds. [*]Center tank pump pressure increased so it will empty first. ​Now, open up the download. Then open one of the subfolder (example, PW4062). You should see 747-400 United under the PW4062 folder. Copy that and drop it into the folder named PW4062 you have created. Click yes for replace. Copy the contents of the object folder into the objects folder inside the folder you created. Click yes for replace. Copy the airfoil folder into the folder you have created. Repeat these steps for other engines. Incredible thanks to CWilliams for posting this great page: http://forums.x-plane.org/index.php?showtopic=61457. 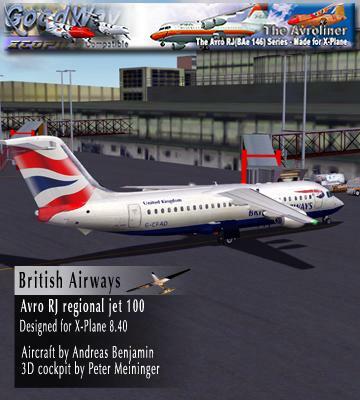 Dedicated to Pierre Lavaux who showed me that page, and Peter Tram, and the whole of X-Plane Aviators for their support. Thanks to Mohammad Gazzawi / Sergio Santagada / Javier Rollon for the basic 747. Pierre Lavaux is working on the custom sounds for the next update, and Alex Reichert is working on the systems too. I would think these would be included for the next update. 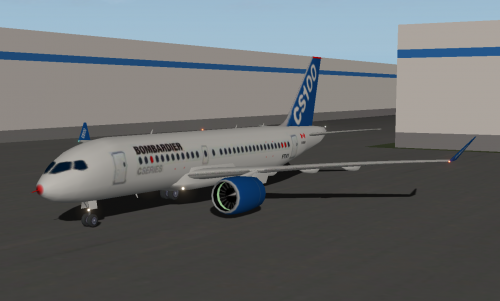 This is a first release of the first CS100 as it was at its first flight. You can use these files if you mention the credits. Entirely made using Plane Maker, no objects. A series of pre-cut x737 Cockpit Panels of varying size; which put larger focus on the EFIS displays and instruments vs the wide screen display. For users who use the EADT x737 with differing 16:9 or 16:10 aspect ratio monitors; Or, 1680x1050 or 1920x1200 monitors. I made a series of them, which I use on different systems (depending on the aspect ratio and native res I run it in). Works for different 4:3 Narrow and 16:9/16:10 Widescreen users. Download Contains 13 different sizes and cuts. Find the one that works best for you! Remember to rename the file to "panel.png" when dropping into the EADT x737's -PANELS- directory. This model is the Boeing 767-200 NON ER with GE CF6-80A engines and a small cargo door in the front. This plane has no liveries at the moment. This model is the Boeing 767-200 NON ER with GE JT9D engines and a small cargo door in the front. This plane has no liveries at the moment. This model is the Boeing 767-200ER with GE CF6-80A engines and a small cargo door in the front. This plane has an American Airlines livery done by Jzeitlin. Credits and criticism for the livery should go to him. This model is the Boeing 767-200ER with GE CF6-80A engines and a large cargo door in the front. Liveries included are all three US air paints. Black is by Philip Foglar, white and Retro are by Jzeitlin. This model is the Boeing 767-200ER with GE CF6-80C engines and a small cargo door in the front. No liveries are included for this model. Inside, you'll find an Excel spreadsheet that will detail all the airlines that have ordered this plane and the engine type that they used. This model is the Boeing 767-200ER with GE CF6-80C engines and a large cargo door in the front. No liveries are included for this model. Inside, you'll find an Excel spreadsheet that will detail all the airlines that have ordered this plane and the engine type that they used. This model is the Boeing 767-200ER with GE JT9D engines and a small cargo door in the front. No liveries are included for this model. Inside, you'll find an Excel spreadsheet that will detail all the airlines that have ordered this plane and the engine type that they used. This aircraft uses two Europrop TP400-D6 engines, the same engines used on the upcoming Airbus A400M. On the right side of the panel, turn on the battery, avionics, and both generators, then the igniter and fuel switches for each engine. Press and hold each start button for five seconds until startup, then turn on the Inverter as well. Lower flaps one or two notches depending on runway length. Throttle engines to full power, rotate at 115-135kts depending on weight. Retract gear, raise flaps as needed. Climb at no more than 1000 fpm. There is a maximum takeoff weight of 100,000 pounds, though the aircraft will fly at up to 200,000 pounds. Just don't expect to survive an engine-out, or any other situation, hence the 100,000 pound limit. NOTE: This aircraft is unpressurized. Do not climb above 10,000 feet. Use generous amounts of rudder, pray. Slow to 110-125kts depending on weight, deploy flaps to full as needed. Always keep some power to the engines, if you close the throttles the plane will drop. Flare, close throttles for touchdown, engage full reverse thrust, add brakes as needed. Disengage reversers, taxi off runway. Extend speedbrakes to open door, imagine cars rolling off the plane. Receive large payment from customer. Buy yourself and co-pilot a beer, providing proceeding flight was last of the day.